Libor, gotta tell you buddy, after 10 years of not hanging out, I can still remember your chicken wing eating ability and have yet to see someone clear the meat off the bone quite like you big guy! 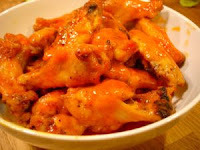 If you happen to be in Dublin again I have fond memories of the Spicy Chicken Wings at Tribeca, in Ranelagh (http://www.tribeca.ie). They come on the menu under Appetisers, but it's a full main, and.. delicious! At least for Dublin!